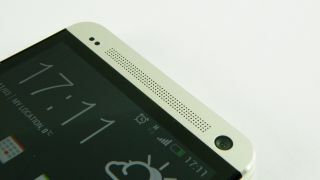 HTC is wasting no time building buzz around the All New HTC One, due to launch at a March 25 event. Over at the HTC Twitter account, the company has posted its "first teaser" video touting the upcoming device's sound enhancements. You can also start using "#HTCOneUp" if the spirit moves you. Sure, the first HTC One had super sonic qualities thanks to BoomSound, but the HTC One 2 will have a redesigned (trumpet noises) along with (more trumpet noises). HTC has increased (did they sample Louis Armstrong?) further, too. In short, with the New HTC One, the sound is even more (that one sounded like a tuba). HTC said this is only Episode 1, so look out for more teases talking up the smartphone's other features to come. It's finally here - read our Samsung Galaxy S5 hands on review! Will the iPhone 6 have stellar sound too?